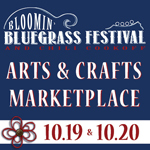 "Join us for Blooms, Tunes & Chili Spoons! Don’t miss the 3rd annual Bloomin’ Bluegrass Festival--this event will feature Grammy award winning bluegrass artists, a taste of some of the best chili in DFW and the magnificent Rose Gardens of Farmers Branch. Admission is FREE and includes lots to do for the entire family including a kid’s area, arts and crafts vendors and concession booths. Chili tasting will be held on Saturday starting at 11am and will be served until it runs out. Sampling Cups are $3 and all proceeds benefit the Friends of the Historical Park and the Bluegrass Heritage Foundation. Bring your lawn chairs and blankets or rent a chair from the Friends of the Historical Park for $2 per use." Booths are 12 X 12, include electricity, and cost $20. Applications are available here and are due by September 28th, 2012. For more information, visit their website, facebook page, or contact their event coordinator, Kim, at kim.chapman@farmersbranch.info / Phone: 972-919-2620.